The number of shots in the burst. Every ball is measured! The selection of burst characteristics displayed is easily accomplished by pressing a single button on the front of the Paintball Radarchron® Rate-of-Fire. A large 3-digit LCD displays the selected data. The microwave Doppler radar and microprocessor-controlled data processing electronics are housed in an attractive plastic package that accommodates three AA batteries (not included). The package measures 3 3/4″ wide; 5 1/2″ long; and 1 5/16″ thick, weighing 11 ounces. The Paintball Radarchron® Rate-of-Fire has a wire bale that supports the unit on a flat surface (table, bench, counter, etc.) and also has a threaded fitting for mounting onto a tripod. 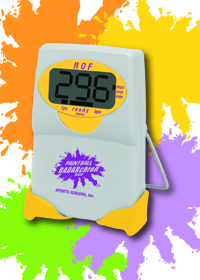 Shots can be measured from a marker barrel positioned about an inch directly over the Paintball Radarchron® Rate-of-Fire, or about an inch on either side of the unit. 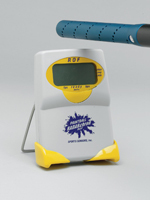 Paintball speed measurements range from 150 fps to 450 fps; speed accuracy is nominally within 1%. The range of rate-of-fire measurements is 3 bps to over 30 bps, with up to 85 bps demonstrated electronically. Rate-of -fire accuracy is nominally within one-tenth bps. The characteristics of a burst of over 500 balls can be measured. The versatile PBR-ROF is affordably priced at $139.95. A leather Holster, priced at $19.95, is available for convenient carrying.